Korea‘s ink-and-wash paintings have faced many challenges in the 20th century, threatened by influence from Japan’s colonial rule and the influx of Western culture. Lee Sang-beom and Byeon Gwan-sik were leading artists, who sought to reinvent Korea’s traditional painting and succeed the master painters of Joseon era such as Gyeomjae, Danwon and Owon. Now they are being featured side by side at Gallery Hyundai, giving visitors an opportunity to view and compare their works. “I think Lee and Byeon are the two most important ink-and-wash painters of our time, and greatly influenced later generations,” said Song Hee-kyung, a visiting professor at Ewha Womans University. The exhibition of the two 20th century artists is the first of its kind in 20 years. It features 80 paintings, ranging from their earliest to last pieces. The gallery has borrowed paintings from the National Museum of Modern and Contemporary Art in Korea, Leeum, Inju Foundation for Art & Culture and private collectors to better show their artistic oeuvres. The two artists share certain backgrounds. They studied under An Jung-sik and Cho Seok-jin, the two most renowned and respected artists at the end of the Korean Empire. They once worked together in a group called Dongyeonsa -- one of the first gatherings of Korean painters founded by Lee in March 1923. However, they took different paths. “The two had very different personalities, as shown in their works. If Lee was calm, Byeon was more protean,” said Park Myung-ja, founder and president of Gallery Hyundai. Lee was born in 1897 in Gongju, South Chungcheong Province, and moved to Seoul when he was 10. He soon started his calligraphy and painting studies under An and Cho. His talent as a painter was recognized by the time he was in his 20s. In 1920, Lee participated in creating a mural at Changdeokgung. He designed “Three Sacred Men Gazing Upon the Waves” for the west wall of Gyeonghungak, which was rebuilt in 1917 after a fire. He continued to submit his works to the Joseon Art Exhibition, inaugurated in 1922 by the Japanese governor general of Korea, and continued until 1944. From 1922, Lee received special awards eight consecutive times. He was also awarded the highest honor of the Lee Royal Family prize. “Early Winter” was featured in the fifth Joseon Art Exhibition. The work captures a scene on a canvas with a ratio of Western paintings rather than the traditional horizontal tableau. It shows a stylistic departure from Korea’s traditional landscape paintings, according to Song. Lee’s works often capture scenes of humble and simple lives that are in harmony with the surroundings. In his works, he shows scenes of farmers with donkeys strolling on a mountainside or a fishing boat on a stream against a backdrop of low gentle ridges depicted in layers of watery ink. In contrast, Byeon’s works appear more vigorous in expression. His paintings have bolder lines and more defined colors. 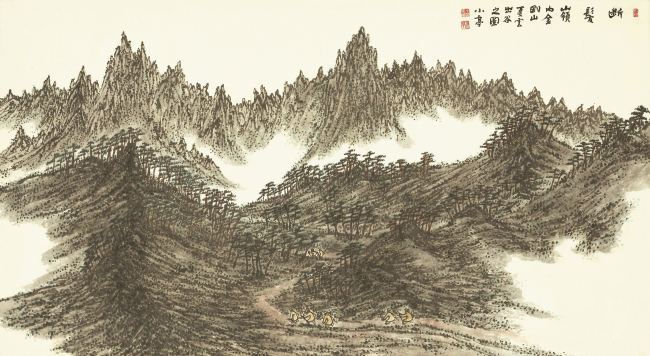 Rusticity and wilderness are some of the main characteristics of hispaintings, as seen in his depictions of Geumgangsan. “One cannot think of the art of Sojeong Byeon Gwansik, separately from Geumgangsan,” said Oh Kwang-su, an art critique and director of Museum San. 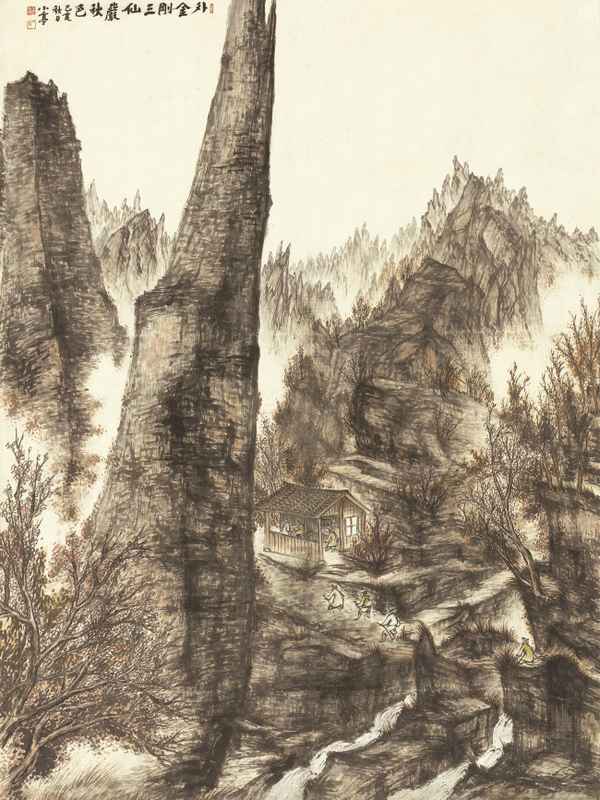 Many paintings of Geumgangsan were produced when the artist went on sketching tours, according to Lee Joo-hyun, an art history professor at Myongji University. Painter Byeon was born in 1899 in Ongjin, Hwanghae Province, in today’s North Korea. He won consecutive awards from the Joseon Art Exhibition and embarked on studies in Japan after he became acquainted with Komuro Suiun, a master of Japanese Nanga paining, who visited Korea for the 1925 Joseon Art Exhibition as a judge. He, however, did not allow his studies in Japan to take over his style but continued to develop his own. “Being active not passive, innovative not imitative,” professor Lee said, quoting Byeon’s attitude to life and art. “Danbalryeong Ridge” (1974) is one of Byeon’s works notable for his unique techniques. The works by the two masters are being separately shown at Gallery Hyundai’s old and new branches located near Samcheong-dong. The exhibition runs through June 16.